Super Charged Blog: Can Eddie Royal be that final key for the charger offense? Can Eddie Royal be that final key for the charger offense? In the offseason AJ Smith made a big splash after losing Vincent Jackson. One of the many impressive additions was Eddie Royal from rival AFC West team the Denver Broncos. Eddie Royal was fantastic in his rookie season with a decent quarterback in Jay Cutler but in all honesty dropped off a little after that. Getting an even better quarterback than Cutler in Phillip Rivers should restart his career and I would expect him to double last years production at the very least. 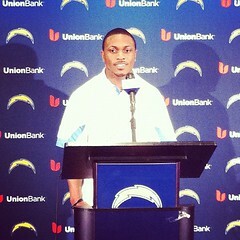 Royal will be the chargers slot receiver and will have the speed and talent to go make the big plays for the chargers. He will provide an extra option for Rivers who won't have to just chuck it up to the big tall receivers like Floyd all the time as he will also be able to find those smaller speedier guys who can find separation like Royal. Royals talent was recognised by many, most prominent of which was Mike Shannahan who tried very hard to get Royal to Washington. Instead Royal chose San Diego and he should be overjoyed to see number 17 throwing too him. This should completely transform his career after having Tim Tebow throwing to him last year. It's not only offense that Royal should help out the chargers. He is also an excellent returner as the chargers learnt to their cost when Royal returned a punt and a kickoff for a touchdown in one game. This will be very important for the Chargers who only managed to return one kick for a touchdown last year with Goodman against the Raiders. Even if he doesn't return the ball all the way to the end zone he should be able to get better field position for the offence which would massively help Rivers to get down the field. All in all Royal was a very good under the radar pickup for the Chargers and should help Rivers get back from his disappointing season last year.